In my mind, a good book is one that I have read more than once. Some I have read many times, and still enjoy them each time I flip the book open and start reading. I know the character’s lines and what they wear, and what is going to happen next. We have one faithful fan who has read Plank Road Summer often enough to remember the bouquet that Florence Mather makes. A “Florence Bouquet” at our Plank Road Winter book launch. Julie K.S. 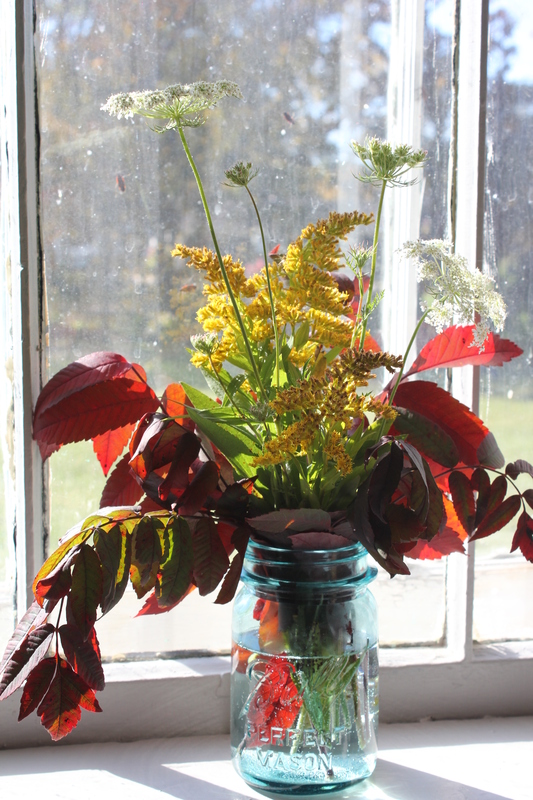 Moyer, who currently lives in the Mather Inn with her husband and children, made beautiful bouquets to place on each window sill of the old Yorkville School for our book launch. We suspect that not many of our other readers recognized the combination of flowers and leaves, but we were quick to notice and appreciate it. Julie was also the force behind getting Yorkville School #4 on the Wisconsin National Register of Historic Places. The bright 4-H green paint that covered the railings back when we used the the building for 4-H meetings and music and drama practices has been restored to the original colors, and the hardwood floor refinished. Her attention to detail shows in the beauty of the schoolhouse, and in our bouquets as well. We are honored to have such a great fan and neighbor. 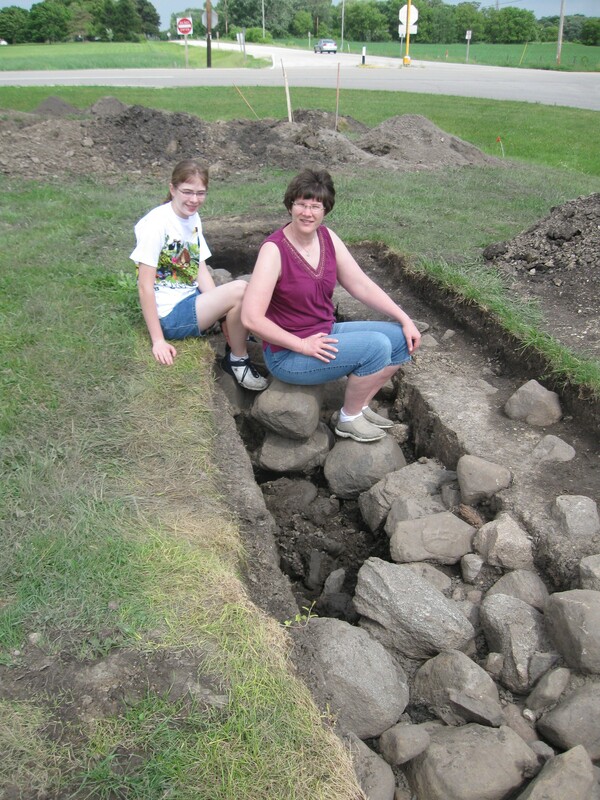 Emily Demuth and her daughter, Louisa, at the Mather Inn well excavation. The archaeologist, Norm Meinholz, was digging at the site of Mather Inn again this month. This time, I managed to get back to Wisconsin while the dig was still open. Meinholz had uncovered part of the old foundation and established the exact location of the Inn, when it stood facing the Plank Road. The Mather Inn itself still stands a stone’s throw away–it was moved many years ago, and now faces what would have been the Section Line Road between the Mather and McEachron properties. Just a few paces west of the foundation, the archaeologist had found the well. Stones formed a perfect semi-circle (only half had been uncovered). It was easy to imagine Katie pulling a bucket of water from the well, setting the bucket on the stone rim, and peering at her reflection–even though that scene was edited out of our book during an early revision. As I walked around the original site of the Inn and stood where the front door had once been, I slipped back in time–back to when traffic sounds were the creak of a harness or clopping of hooves, and when water came not from the faucet but from a bucket drawn daily from the well. Had Hilda and I seen this circle of stones a couple of years ago, I’m sure we’d have kept the well scene in our book. Click here to read a newspaper article about the first dig. I didn’t always want to be a writer–I had other plans for my future. For a long time, I wanted to be an archaeologist. I remember digging up bits of old pottery from the rock pile behind the sheds. Finding a particularly colorful piece, I imagined some woman’s sadness about her favorite vase being broken. My greatest archaeological discovery was a small arrowhead that I found in the pickle patch when I was twelve. My brother and sister insist the only reason I found it was that I was too busy looking at rocks to pick pickles. Seeing the Indiana Jones movies in high school fueled my desires–so much so that when I went away to college, I ended up with the nickname “Indiana Emy.” As it happens, my journey took me in another direction, and I never did find much more than that treasured arrowhead. 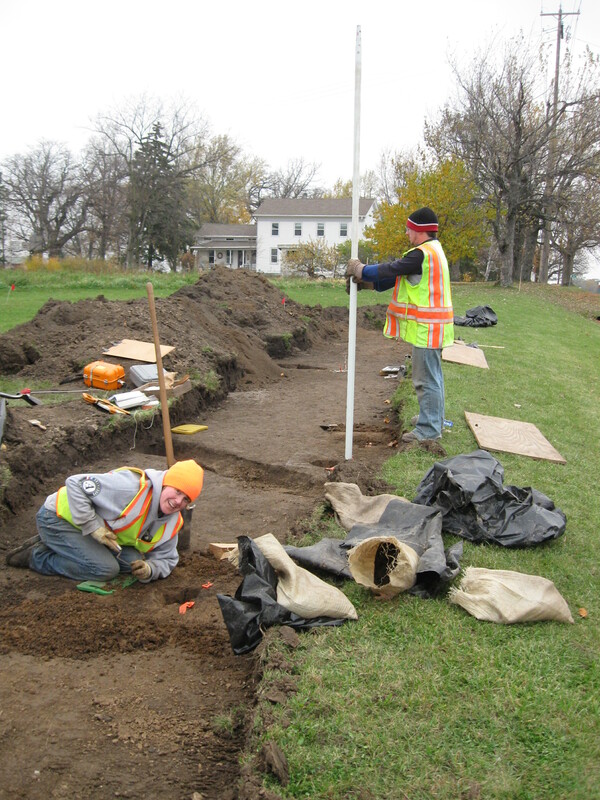 But last fall, an archaeological dig took place at the original site of the Mather Inn. And I missed it! A real archaelogist dug up shards of flow-blue pottery, and old nails, and even an entire jug, intact. By the time I visited in October, the dig site had been covered back up. But as I kicked about the site I spied a bit of white shining in the sun. Not an arrowhead, but a broken shard of pottery. Perhaps a bit off a plate, a platter, or a chamberpot from the Mather Inn. Somehow that little bit of physical evidence brought our Plank Road story closer to life. Florence and Katie are fictional characters, but the Mather Inn was real. Meals had been eaten, teamsters had been served, dishes had been washed. I’m glad there are people at work, digging up bits of the past for us. And though I’m not one of them, maybe my writing can help preserve the past as well.